A look at the company's impressive 2016 and why the stock remains worth buying. We are getting to the end of 2017, and it's time to reflect on whether the near-36% rise in Ingersoll-Rand Plc's (NYSE:IR) stock price means the stock is overvalued or not. I would argue that, despite the strong rise, the stock still looks like a good value. 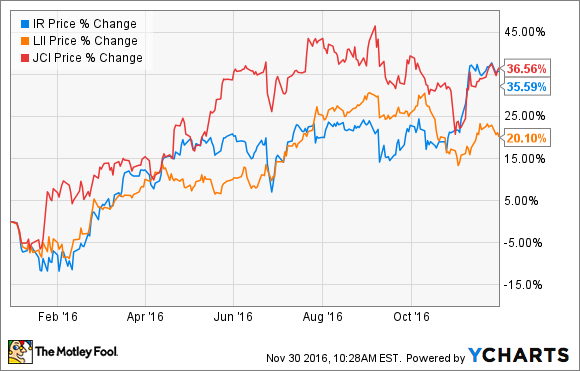 Ingersoll-Rand faces some headwinds in 2017, but management has executed well this year in positioning the company for long-term growth. Here's how and why. As you can see in the chart above, it's been a good year for the Heating, Ventilation, and Air-Conditioning industry, particularly in the US. Lennox International's (NYSE:LII) core strength is in the residential market (revenue up 11% in the third-quarter), while its commercial market revenue increased 2% in the same period. Meanwhile, Johnson Controls International Plc's (NYSE:JCI) secured building efficiency segment orders grew 6% in its recent fourth-quarter, with North America product orders up 7%. These industry trends have played out at Ingersoll-Rand as well, which is a commercial HVAC-focused company generating around two-thirds of its revenue in North America. Data source: Ingersoll-Rand plc presentations. Industrial businesses are in green, climate in blue. Chart by author. On the other hand, its motley collection of industrial business have seen revenue trending in the other direction. As you can see below, the climate segment has propped up total growth this year. Data source: Ingersoll-Rand plc presentations. Chart by author. That said, what can investors expect going into 2017, and is the stock still a good value? I have five positive things and two negatives to look out for. First, climate margin expansion (see chart below) has been excellent as Ingersoll-Rand continues to catch up to the kinds of margins generated by peers like Lennox and Johnson Controls. Second, CEO Mike Lamach sees the company's industrial markets as "flattening" with "easier comps coming into 2017," and believes the segment's margin has bottomed out and will improve in 2017. As you can see, the segment's margin has sequentially improved in the last two quarters. Third, the company's North American commercial HVAC business is not as cyclically aligned as you might think. In fact, 50% of it is aftermarket. Of the remaining 50% equipment revenue, 65% to 70% of it is replacement. In other words, only 18% of North American commercial HVAC revenue is for new construction. Fourth, management's execution on margins within the climate segment has been excellent: the segment has more than made up for disappointing industrial results, and has led to significant increases in full-year 2016 EPS and free-cash flow. For example, management started the fiscal year forecasting adjusted EPS in the range of $3.80 to $4, but as of the third-quarter management now expects $4.17 to $4.22. In addition, full-year free-cash flow is now forecast to be $1.3 billion from an estimate range of $950 million to $1 billion at the start of the year. Fifth, the execution clearly makes the stock a value pick in its peer group. By my calculation, its Enterprise Value (market cap plus net debt) to free-cash flow multiple for 2016 is 16.9 times. As you can see below, that's relatively cheap, and going forward CFO Susan Carter plans for free-cash flow growth to equate to Earnings Before Interest and Taxes (EBIT) growth. 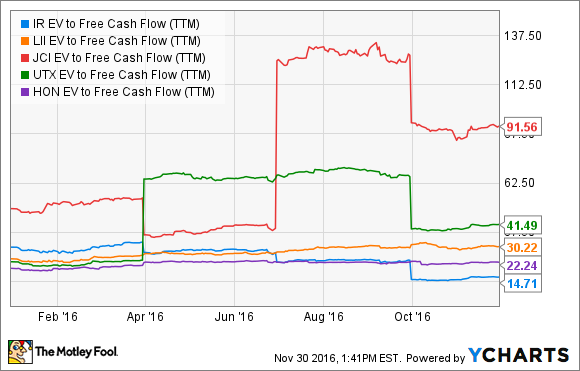 Unfortunately, Ingersoll-Rand faces a tricky year with its Thermo King transport refrigeration sales in 2017 (see first chart above). Lamach expects a "20% decline in trailers next year," and Thermo King will be challenged to grow operating income next year. Indeed, analysts have Ingersoll-Rand growing EPS by just 6.4% in 2017 to $4.47, so it's not going to look like a high-growth stock next year, despite the underlying improvements. Ingersoll-Rand's Trane is the key to its growth prospects. Image source: Ingersoll-Rand website. On balance, I think so. Next year won't be great, but there is no reason why the company can't accelerate growth in the future particularly, when the cycle turns for Thermo King. Furthermore, any potential upturn in the industrial segment will lead to operational leverage, which could see lead to some upside surprise. It's not the sexiest stock you will ever hold, but there is nothing wrong in a cash-generating company which is expanding margin while exceeding expectations. Throw in a useful 2.1% dividend and the stock remains attractive at these levels.